DAY 6 Yalta. (Mon.) Yalta Leisure Time & Optional Tours. 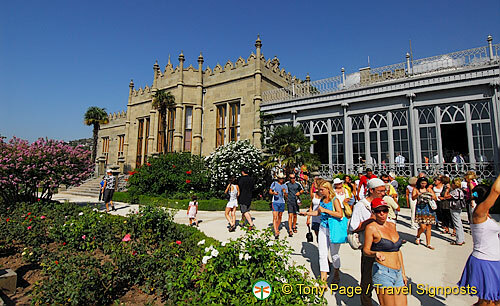 Your day is free to explore Yalta at your own pace, or you may choose to join one or both of today’s optional tours. This morning’s optional tour is of beautiful Alupka Palace. Designed by English architects in 1828, the palace is an unusual combination of Scottish castle and Arabian fantasy set in an exotic park. Your palace tour reveals fascinating architecture, paintings, sculptures, and features a walk through the gardens (cost of the optional tour is the equivalent of €23, which includes coach transportation and a guide).In the afternoon you may choose to join a tour of the former home of Anton Chekhov, the Russian short story writer, playwright and physician. After his father’s death and his own diagnosis with tuberculosis, Chekhov bought a plot of land on which he built this two-story house in Alushta, where he lived with his mother and sister. Here he wrote two plays, Three Sisters and The Cherry Pickers, and continued to practice medicine (cost of the optional tour is the equivalent of €15, which includes coach transportation and a guide). Dinner is served aboard and your ship remains docked overnight. 08:15 – Early morning departure for optional shore excursion to Aloupka Palace. This exotic palace with its blend of Arabic and western architecture is definitely worth visiting. You’ll have a guided tour of the interior to see the fascinating architecture, paintings and sculptures of Count Vorontsov and then take a walk through the gardens. Amazing place. Back to the boat for lunch at 13:00. 15:00 Anton Chekhov’s house visit was yesterday and this afternoon’s optional shore excursion is to the Nikita Botanical Gardens with its collection of 28,000 plant species. We didn’t do this, but instead spend the afternoon exploring the embankment and beach area. The embankment is the town’s main artery and therefore a very busy area. There’s a lot you can do to occupy your time here. It’s a hive of activity, with amusement parks for kids, shops, supermarket, restaurants and cafes. Tip: You can stock up on your beer and chips or other beverages here. The internet is at the Locanda Hotel at the northern end of the beach. Local tour boats take holidaymakers to Swallow’s Nest and elsewhere. There’s a chairlift that takes you to the top of Darsan Hill. You get great views of the coast and harbour from the top. Note: The chairlift doesn’t stop at the stations. You have to jump on and off quickly and the space is quite tight inside. Walking along the beach to the western end and you’ll see lots of people enjoying the sun. The beach, although a stone beach, is very popular with local and Russian tourists, keen to get as much sun as possible before the harsh Russian winters. Dinner was at 19:30, after which there was another vodka tasting session. Alternatively, you can have a quiet drink in the Sky Bar to the tune of Vlad the musician.